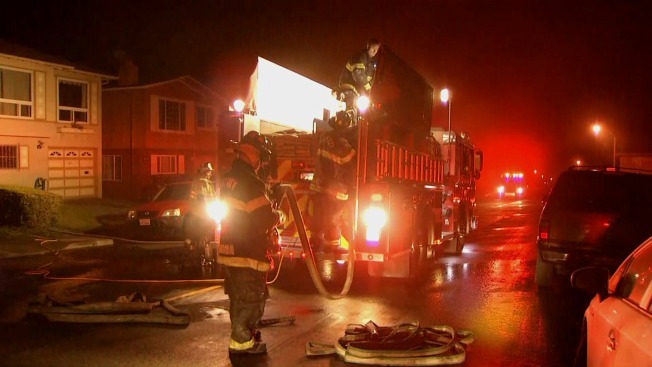 Five people were displaced and one suffered smoke inhalation injuries in a residential structure fire in Daly City early Thursday morning, according to firefighters. The fire was reported at 2:22 a.m. in the 700 block of Higate Drive, according to the North County Fire Authority. A total of six fire companies responded to the two-story single-family residence. As they arrived on scene, there was smoke coming from the front and back of the structure, and after entering the structure they found fire in the rear. The flames were contained to the first floor, but the second floor sustained heavy smoke damage. Fire officials told NBC Bay Area they suspect the fire sparked in a converted unit at the back of the home's first floor. That has yet to be confirmed. Crews remained on scene for more than two hours to make sure the fire didn't ignite again.